Found this article that tells about a TubeMogul study where they found that 81.19% of people will leave if the video rebuffers even once. 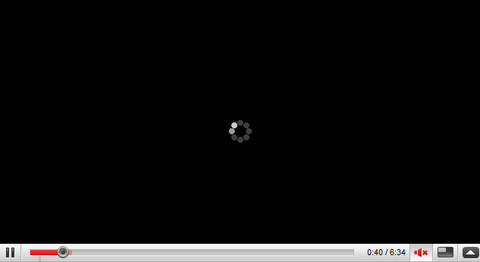 Of course, a video doesn’t rebuffer for everyone. The study says that out of the services they tested, 6.81% of the streams rebuffered. 81.19% of that would be a bit over 5.55% of the total: the percentage of people that left the page because of a rebuffer. Of course the conditions of that test may -most probably- be different from your own. I know I’ve been to the sales pages of different offers that had their video rebuffer, sometimes repeatedly, so I assume it’s likely that some marketers don’t worry about this point as much as they should. I know that a sales page has more things for one to do in it that just watch a video, compared to a page that is there just for the video, but I’m sure that the rebuffering affects sales page visitors as well, especially those relying on video to sell. It’d be interesting to monitor the rebuffering in sales pages, but the best bet will be to never have it do that. Thought it’d be important to show you guys this, because it’s common sense that video should start fast and not be interrupted, but I’m sure most of us didn’t have an idea of how crucial it is. Your server hardware is fast. This is particularly important if it has to serve several visitors at the same time. Your server connection is fast. Also the closer the server is to the visitor, the better. A solution like Amazon’s CloudFront makes a lot of sense, especially for an international audience. Your video is very optimized. If the compression doesn’t reduce the file’s size enough, lower the quality or/and reduce the resolution. Have everyone you can dummy run the sales process with people from different places to make sure they have no problem whatsoever, I’d suggest having friends from different locations load your page and tell you if they had rebuffering happen during video playback. Make sure you get some dialup and mobile users in the test too!